Milk Unleashed Giveaway! Enter to win a month’s supply of shelf stable milk. In honor of Dairy Month, Milk Unleashed is looking for fun photos that show how shelf safe milk has helped your family get nutritious, delicious dairy on the go. Open to Canada and United States. Ends June 23, 2013 @ 11:59 pm (PDT). The only mandatory entry is to submit a photo including shelf safe milk. The winner will receive a month’s worth of shelf safe milk. The runner-up wins a Milk Unleashed sample pack. 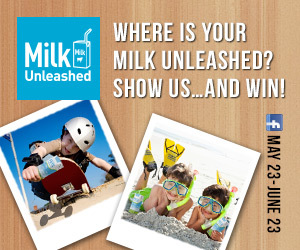 Enter the Milk Unleashed Giveaway HERE. This post is brought to you on behalf of GiveawayBooster.